As a [very] amateur letterpresser, I’ve been through a few struggles when it comes to finding ink. I managed to learn when we first got our press that litho inks (that is, the inks used in big offset printers) are good to use, and found forums of discussions where people have said they get friendly with their local print shops and scrounge odds and ends of ink from them. I managed the same trick only once, but now I’m trying to actually make some things on the press, I’ve needed to expand further than the dregs my local print shop very kindly gave me a couple of years ago. The thing is, in my experience at least, it’s pretty ridiculously difficult to even find litho ink, let alone in the smaller quantities that a letterpress hobbyist would need. 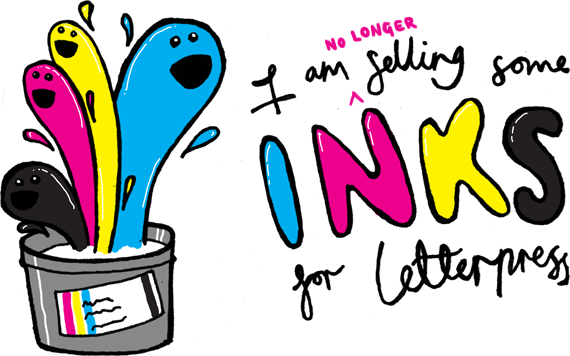 I have kept my eye on eBay recently and managed to score four brand new tins of process ink; that is, cyan, magenta, yellow and black. The only thing is the tins are 2.5kg each (for a total of 10kg of ink! ), which I don’t think I’d ever be able to get through in a lifetime on an Adana Five-Three. I figure there must be plenty of other hobbyists out there who have similar problems, so rather than waste all the ink that I don’t use, I have decanted all of the ink into jam jars to resell to people (hopefully like you!) who are also looking for smaller amounts of ink to use with their letterpresses. 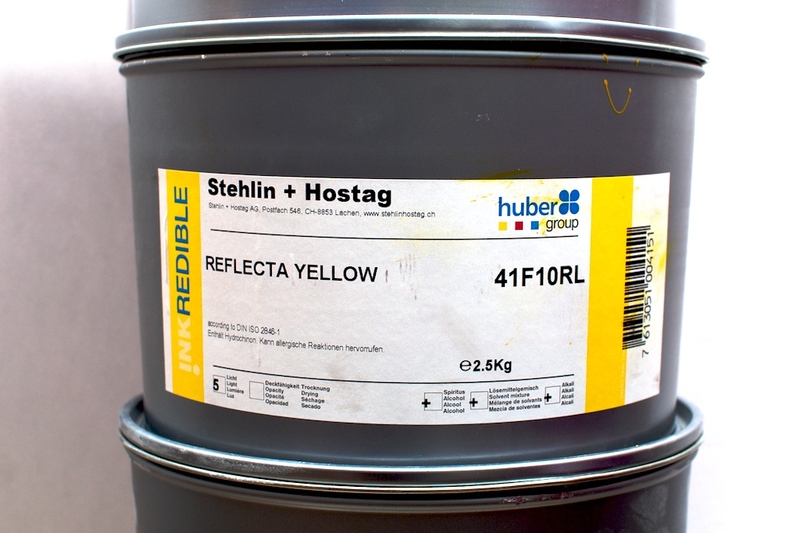 I bought them without knowing a great deal about them other than that they’re litho inks and that they were CMYK, but in case you know more about than inks than I do, then I can tell you that these inks are Stehlin+Hostag ‘!NKREDIBLE’ Reflecta inks. They seem reasonably standard to me. You can read more about them on these two PDFs I found on the manufacturer’s website. I understand !NKREDIBLE is the range of litho inks, and reflecta denotes a sub-range that has a glossy finish to them. Cool! Here is a photo of one of the labels on the tins. All the labels are much the same apart from the name and product numbers. From what I could tell, the aforelinked PDFs seemed to offer more info than the label on the tin does. I have decanted the ink into some nice jam jars, in which I have measured 300g of each colour. 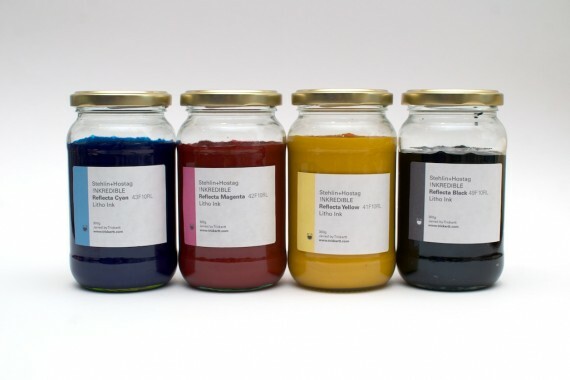 That should keep a private press going for a while: I understand Caslon still sells Adana-brand inks in 150g tubes, so these jars should be plenty. I have put the jars into ziploc bags, then wrapped the jars individually with bubble wrap and boxed them with a load more bubble wrap and/or newspaper padding the boxes out to (hopefully) protect from any damage in transit. Speaking of which, I have learnt from past eBay conquests to not offer any postage services that don’t offer insurance and tracking, so while I’m not intending on jars breaking, I can’t predict what delivery companies do when they’re not delivering, and any losses can be accounted for. But really, I know you just want the ink and not a hassle, so I have packaged them as thoroughly as I can. I have six sets of four inks to sell – one each of cyan, magenta, yellow and black- 300g of each in individual jars (because they’d be no good if they were all mixed in to one!). I have a seventh set as a backup in case I do need to replace any, so I shall see how the sale goes. I’d like to stress the fact that I am not the manufacturer of the inks I am selling, and neither do I know much about them, other than what has been posted above. I am selling them to try and help some other beginner letterpressers like myself and not as any kind of assured dealer or anything like that. They are being sold on the basis of the description I have made here. If you have any questions about them, I will do my best to answer them before you buy them. Considering all of this, I am not planning on offering any refunds on this ink, unless anything gets broken in transit and you don’t want a replacement, or I don’t have a replacement available (though I will make it clear if that is the case before the sale is made). If you’re not happy with them for any reason other than relating to the delivery of them, then I’m afraid it’ll be your lookout, so please make sure you are happy with everything you’ve read here before buying. OK, I’ve read and understood all that, tell me about buying them! I am selling a set of four inks for £20 plus postage. I have put two sets on eBay to start, so if you like eBay, you can go there to do its thing. If they sell ridiculously quickly there, I will add more, but that currently leaves another four sets to be sold. We can do the transaction outside of eBay so I can avoid their fees if you like, in which case you can pay me by paypal (or in cash if you choose to collect in person). If you do wish to buy outside of eBay, then you should email me at ricky@trickartt.com to get the ball rolling with me. Postage is totally up to you. The default option would be Royal Mail First Class Recorded, at £9.72. I can drop this around to the post office as soon as I receive payment and an address to send them to, providing the post office is open. You might not like Royal Mail though, and instead have a preference for a courier. If that’s the case, I recommend Interparcel, where you can choose any service and price that suits you; the package will be 2.5kg and 20x20x20cm. I like Interparcel and have used them several times in the past, but I don’t have a preference of which courier to use. If you do have a courier preference, let me know before you send payment and I can arrange collection and delivery. I am willing to post to western Europe too, in which case you can look up a relevant postage service on Interparcel too. All the inks are now sold. Sorry if you missed out! Well that’s about it, so I think all that is left to say is happy pressing!